This is my niece, Alyssa. 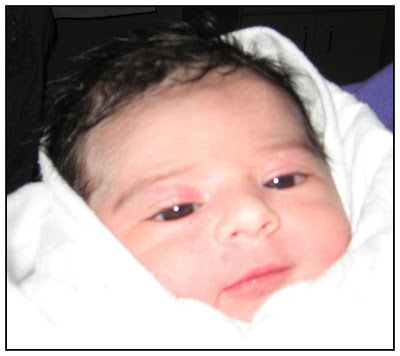 She was born today (March 18, 2008) at 2:16PM EST and she weighed 7 lbs 11 oz. My younger sister, Vinie, delivered Alyssa at the Guelph General Hospital in Guelph, Ontario, Canada. We are all very happy and excited to have a new family member. I celebrated my niece's birth with some champagne today. I am a very proud and happy uncle. My wife, kids, and I can't wait to visit Toronto soon to see Alyssa and family. Congratulations, Vinie and Dale! Enjoy the new bundle of joy. Welcome to the family, little Peanut! Love you lots. Wow what a head of hair. Very cute baby. Congrats to all!!! !